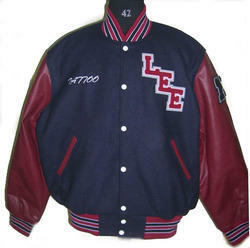 A letterman jacket, it is made of wool body with leather sleeves . Having a diamond quilted lining, it has two slash pockets and one inside pocket with complete snap front closure. Its matching neck bands, cuff and tricot waist provides an elegant look. 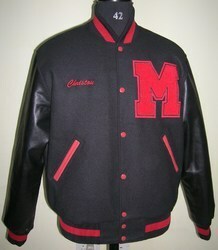 High quality Melton wool is used by Caliber Apparels to make these varsity. If you take care of your jacket it would last several years of rough use. 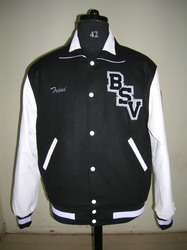 We are the manufacturer of Sports Varsity Jacket. Its wool with leather or wool with vinyl sleeves. 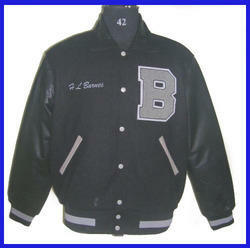 Sports team, athletic association, coaches use these jacket to display their jacket pride. We use premium 24 ounce molten wool and supple top grain cowhide leather. 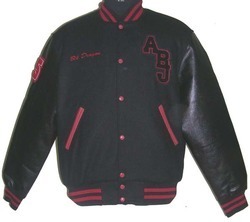 We are leading manufacturer, supplier and exporter of Wool-Leather Fashionable Varsity Jacket. 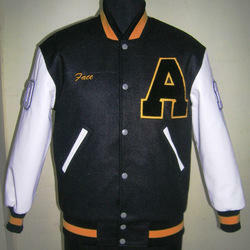 We offer to our clients a wide product range of Fashionable Varsity Jacket. These jackets are designed in such a way that it displays personalized designs of embroidered. We have an exclusive collection of Collar Varsity Jackets which are manufactured in various color combinations and designs as per demanded by the customer. These garments are designed with premium grade quality raw material according to the market trend and are very comfortable and available at competitive price. Packaging Details: Nicely raped in celifin polybag with box and bulk orders-17 jackets in a box. 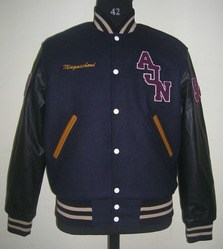 We offer navy body with cardinal leather sleeves varsity jacket with left chest and sleeve patch. It has right chest embroidery in script font. We customize chenille patches and embroidery as per the requirement of the buyer. 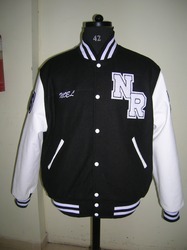 Being the most eminent manufacturer of garments, we presentNavy & White Varsity Jacket. These jackets are highly appreciated and demanded for its basic features like softness and excellent fitting. These garments can be customized in terms of size, color and design. We are one of the leading scarlet parchment varsity jacket manufacturers offering a smart range of varsity wool jackets. These are available in a wide array of color combinations and designs as per requirement of the buyer. 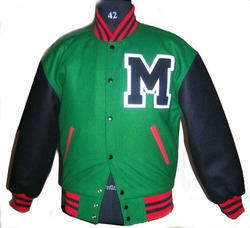 Our varsity jackets are very comfortable and make a fashion statement at the same time. 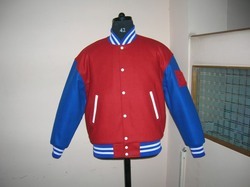 The varsity jackets, we manufacture makes you look different from the others as it is highly fashionable and stylish. 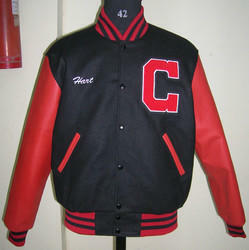 We contain in our store, full black letterman jacket which is a buttoned jacket having side pockets in it. These jackets are skin friendly and available at reasonable and market leading prices with durability and good quality. Customization in form of sizes and colors of these garments is possible as per the requirement of customers. chest "ABJ" CHENILLE PATCH, NICKNAME EMBROIDERY & BACK CHENILLE PATCH. 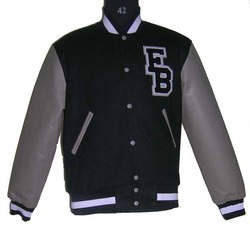 We are leading manufacturers and suppliers of Varsity Jackets. 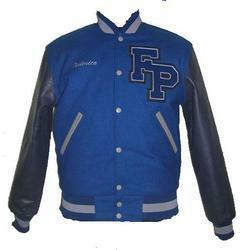 We can offer best quality varsity jackets, Letterman jackets and baseball jackets with highest range of chenille and embroidered patches. Patches are designed as per requirement of the buyer. 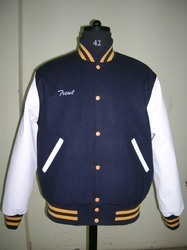 We offer varsity in variety of colours at competitive prices in the market. We contain in our store Trendy Jacket, which is a buttoned jacket having side pockets in it. These jackets are skin friendly and available at reasonable and market leading prices with durability and good quality. Customization in form of sizes and colors of these garments is possible as per the requirement of customers. We manufacture and export a wide collection of Jackets. We introduce the light oxford & black Varsity Jacket. It is an embroidered, buttoned jacket with stylish collar and side pockets. Fabricated from high quality material which ensures its durable life and standard quality. chest "AJN" CHENILLE PATCH, NICKNAME EMBROIDERY & BACK CHENILLE PATCH. 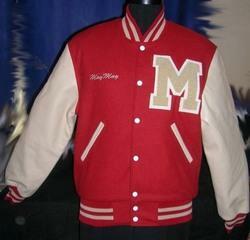 We are one amongst leading manufacturers and suppliers of varsity jackets. These jackets are highly appreciated and demanded for its basic features like softness and excellent fitting. These garments can be customized in terms of size, color, design and stitching to cater the specification of the customers.